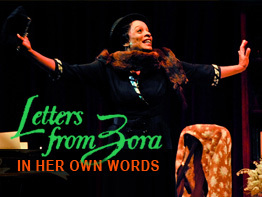 Through the dramatization of personal letters, LETTERS FROM ZORA explores Hurston’s controversial views on integration, segregation and social justice showcasing a life that was filled with artistic triumphs as well as abject poverty and self-doubt. Veteran actress Vanessa Bell Calloway plays the role of Zora in this provocative multimedia production directed by Anita Dashiell-Sparks and written by novelist Gabrielle Pina. With live music composed by Ron McCurdy and archival images collected by Margie Labadie, LETTERS FROM ZORA will illuminate Hurston’s prose, her life, her distinctive array of friends and foes and her unique view of a jazz-age world. As I prepared for my day I listen to interview today with Ms. Pena, Ms. Sparks and yourself this morning. I thoroughly enjoyed the down to earth conversation. No pretense. At any rate. I listen to the late Ruby Dee read “Their Eyes Were Watching God”. I truly enjoyed hearing Ruby Dee. I know it’s past the fact but any chance the show coming to Arena Stage in DC? I’ve always appreciated Ms Calloway’s diversity of her art form!!! Will you be running the Stage play of Zora again and if so will you be coming through Miami?? Love your work and would LOVE to see the play!! !